Most p2p investors with Prosper or Lending Club want to know one piece of information above all else. What is the return on your investment (ROI)? Both companies provide their own estimates of your return and while this information is useful it is in no way the definitive answer. There are several ways that you can measure your p2p lending ROI that I will explore in this post. Both Lending Club and Prosper will give you their estimate of the return on your p2p lending portfolio. At Lending Club you see your NAR (Net Annualized Return) in big type on your account page. This is their estimate of the return on the outstanding principal in your portfolio and while it is a useful estimate it has its limitations. It only gives your return on your outstanding principal so if you have cash building up in your account it will likely overstate your real world ROI. Prosper doesn’t provide your ROI number anywhere on their web site. 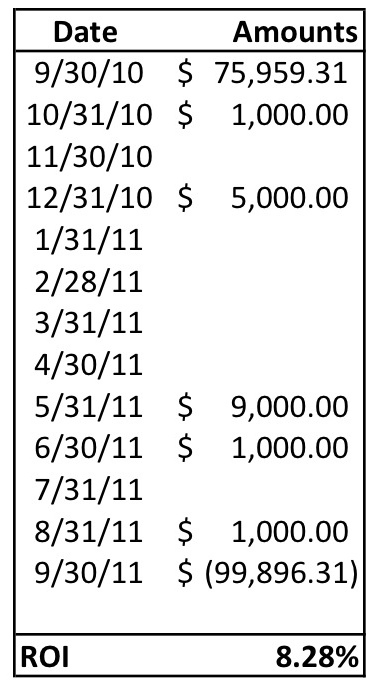 [Update: In November 2011 Prosper started to provide ROI numbers on their site.] It does provide a total gain to date that is expressed in dollars but it will not give you an estimated ROI. However, once a month Prosper emails you an investment summary that provides you with an annualized ROI. Below is my statement from Prosper last month. Prosper’s calculation is a little different to Lending Club but it is still based on outstanding principal. Prosper calculates total interest earned net of fees, defaults, and principal repayments and expresses that number as an annualized figure. But again this ignores any cash that is sitting in your account. If you did not add to or withdraw from your account at Lending Club or Prosper then you can perform a simple calculation to calculate your ROI based on your balance on your monthly statement. You can do this for the latest month, quarter, year or any other period. For example, here are my numbers from Prosper for the previous quarter. I did not add or subtract money from this account last quarter. Then by performing this calculation: ($281.78/$5208.74)*4 you can find out your annualized ROI for last quarter. In this case that number is 21.64%, which is actually slightly more than Prosper’s estimate. The good thing about this method is that it does take cash into consideration although I had very little cash sitting idle in this account during the quarter. This is only available for Prosper investors but I have found Lendstats Prosper Lender Summary to be an extremely useful tool. The trouble with the calculations from Lending Club and Prosper as well as the Simple Method mentioned above is that they do not take into account loans that are about to default. If a loan is 119 days past due and about to default then the above methods include that loan at full value. Now, obviously a loan that is about to default is not worth its full value. So Ken from Lendstats allows every investor on Prosper to find out their estimated ROI based on discounting all the late loans in their portfolio. This way you get a more realistic idea of where your ROI is headed. You just need to type in your Prosper screen name into the Prosper lender search field. For example, with my Prosper portfolio as of today Lendstats estimates my ROI at 15.79%. Which is a more realistic number than the 20% numbers seeing that I have four or five loans that are probably headed for default and a few more that have just gone late. Keep in mind there is one flaw in the Lendstats summary. If you trade actively in the Foliofn platform it does not include this activity in the ROI calculation (only because the information is not available on the Prosper download). So for active traders it is not going to be a very useful estimate of your ROI. For other Prosper investors, though, it is an excellent way to get an idea of what your expected ROI is going forward. While Lendstats provides useful information for Prosper investors Lending Club investors can head over to Nickel Steamroller to find a similar estimated ROI. There is a Portfolio Analysis tool that requires you to download all your notes from Lending Club as a CSV file and upload that file to Nickel Steamroller. The analysis tool with give you an estimated ROI and it will list all your loans. It even marks duplicate notes and provides sell recommendations on notes that are below Lending Club’s average return. But the ROI figure is what I am most interested in. For my relatively new Roth IRA portfolio that Lending Club has at an 18.23%, Nickel Steamroller suggests my estimated ROI is going to be much lower – 11.85%. This is probably because I have three loans that are over 31 days late and another three that are In Grace Period right now. Still I was surprised that there was such a large difference between the two numbers. If you have a young portfolio (with a average loan age of less than 12 months) then Lendstats and Nickel Steamroller are going to give you an idea of your ROI looking forward. They provide an estimate of what your future ROI might look like but for young portfolios they will rarely be accurate when looking at the ROI that has been achieved in previous periods. This is because fewer defaults and late loans occur when a loan is still young. Once a portfolio is over 12 months old then their ROI calculations should be more accurate looking both forward and backward. I have talked about the XIRR() method before and it is my preferred way to determine ROI. By using the balances on your monthly statements and taking into account any withdrawals or deposits you can get an accurate picture of your ROI over any historical period. The XIRR() function (it is explained well here) provides a way to calculate return when you are adding or subtracting to your account regularly. I like it because it is simple and provides a fairly accurate historical ROI number. The chart to the left here shows my total p2p lending portfolio for the 12 months ending 9/30/11. You can see I made several additions throughout the year (but I made no withdrawals). Now, when I make additions I typically take quite a while to invest. For example, the $9,000 that was added in May took over three months to fully invest but I included it in that month because that was when the money began being invested in notes. The XIRR() calculation is a simple one. You have the dates in one column and the additions and withdrawals in the other column – here is my calculation for the spreadsheet above: =XIRR(B2:B14,A2:A14). The closing balance must be negative for the calculation to work. XIRR is not perfect but it is the most accurate way I have found to calculate ROI for any historical period. Of course, it gives you little indication as to what your ROI may be going forward. As an aside I earned a $104 bonus from Prosper during this period which I have excluded from this chart. When I add that in to the spreadsheet my ROI drops to 8.15%. While we all want to know our return there is not really one definitive way to calculate this. Both Lending Club and Prosper have slightly different methods so I prefer to use a method that can be consistent for both companies. In fact, I would dearly like to see a p2p lending standard when it comes to ROI. If we can create a formula that is endorsed by both Lending Club and Prosper I would see that as a big win for this industry. So what do you use to calculate ROI? Or do you just rely on the numbers from Lending Club and Prosper? The five methods I mention here are certainly not the only ways to measure your ROI. I am interested to hear what others do. Please share your thoughts in the comments. Once Prosper.com includes interest earned on their exports I will create the same tool for ROI calculation on Prosper.com. Thanks for the write-up Peter! LendStats also allows LendingClub users to load their data. Not only will you see an estimated ROI, this data then can also be filtered. You will also see a complete breakdown of your portfolio. Just click on the “analyze your portfolio” link from the loan filter page (link below). @Michael, does Prosper plan to add interest earned to their export data files? I’m doing fine without it. I’ve asked on several occasions and told to send a follow up email, which I have done. I prefer to get this value from them rather than caclulate it. How long have you had the portfolio analyzer? @Michael, I just added it a few days ago. @Michael, the calculation is fun you should give it a try! I think I’ll hold out for the export to be updated, thanks though. Good job by the way. @Michael, I’ve asked them several times years ago for trading export data. They told me that they are working on it but years later it still hasn’t happened. It is pure BS. Where did you get these ideas from? The accuracy of the calculations only improves as loans get older. @Michael, Looking forward to that Michael. @Lendstats, I didn’t realize you had added the portfolio analyzer, thank for letting me know. The reason I included the statement about looking forward is that for the majority of investors their portfolios are young and for the first 12-24 months of a person’s p2p lending portfolio the ROI will go down because of defaults. And I believe that Lendstats and Nickel Steamroller provide a useful window on that movement. I will concede, of course, that once a portfolio is of a certain age that your analysis is going to be accurate looking forward or backwards. But for many investors (particularly at Lending Club) that were not around in Prosper 1.0 (which are most of the readers of the blog) your analysis will return a much lower ROI than Prosper states. I realize I didn’t explain myself fully there and so I will go back and change that paragraph. @Peter: “Both the Lendstats and Nickel Steamroller methods are….” Kind of funny Peter…didn’t NSR just “copy/paste” all of Lendstats work? So I think if you reference something in your work you should at least “footnote” correctly. “Lendstats method is” or Lendstats methods are used on both Lendstats and NSR” … come on Peter! @Peter & Micheal: I think both of you should buy a finance book or take some classes….and learn how to perform calculations on your own and learn what financial words, graphs, equations, etc. really say. @RJ, Yes, I believe Michael from Nickel Steamroller bases his calculations on Lendstats. But anyone who has read this blog for any length of time knows that I am big supporter of Lendstats. But I think both web sites add to the knowledge of the p2p lending community. I have never claimed to be a financial professional, I am keen amateur and I am learning as I go (as are most of the readers). If I have made some error please do not just make a blanket statement that I “should buy a finance book or take some classes”. That is not helpful to anyone. Tell me where you think I made a mistake and I will address it. I released my portfolio analysis utility August 7th of this year. Smart Peer Lending then copied it and now LendStats. We’re all working to make p2p analytics better and more transparent. In that respect I fail to see how you determined I copied all of Ken’s work. In fact, I copied none, but I choose to calculate ROIs using the same method which is publicly available on his site . Would you like every bank to use a different ROI method? There is something positive to be said about using the same equations. The LC loan analysis tool has been around long before you as well, some of us may remember that lcnetwork.biz also did this. It was something I intended to do for a long time and I finally got around to it now. The Prosper 1.0 calcs are pretty darn accurate at LendStats and frankly I don’t think that needs to be talked about here. I do however find it odd that you mention it. But since you do mention it I will let you know of a couple of the problems with the Prosper data. There is some data missing in the Prosper export file which limits accuracy like recovery fees and some recovery payments . With LendingClub there is no such problems. As LendingClub’s loans get closer and closer to their final state, accuracy continually improves until it reaches 100% accurate. So the returns on the 2007 and 2008 loans at LendingClub are probably >99% accurate. Any disagreement there? Thanks for pointing that out. That was a subtlety that didn’t go unnoticed by me, but I prefer to pick my bones one at a time. I invented the equation that we all use and I deserve the credit. It may seem simple, but it is profound. Kind of like E=MC^2, LOL. I see you have changed the paragraph, however, I’m not sure what you are trying to say, it is very confusing. @Lendstats, Ken, my whole point here was to show that if your portfolio is less than 12 months old then your Lendstats ROI will most likely be very different from the ROI you are seeing at Lending Club or Prosper. Maybe I haven’t explained it well, but that was all I was trying to say. That’s a good thing to say, but it doesn’t read like that. I think rewording is in order. P.S. I started using XIRR to calculate my returns this year. The LC NAR seems way too high. LC says 11.51% and XIRR says 9.45% YTD. Two percent is a big difference. @Lendstats, I added a clarification. @Lou, Very funny. But I will continue to discuss complex topics even if it means being criticized for some inaccuracies. And yes, I have found the NAR overstates returns by between 0.5% and 2% depending on the portfolio. Peter, I see you edited Michael’s comments. I really would prefer that you not make such edits. Significantly changing the meaning of comments after a thread is finished is something that I highly disapprove of. It looks like someone removed a comment. @Micheal: I will be at the Mad Planet this Friday, if you want to give me an English book, I would be happy to have it. I will wear my Lending Club T-shirt. I find a good finance book for ya. @Lendstats/@RJ, I understand your concern. But if someone asks for their comments to be changed or deleted I have no problem with honoring that request. Also, occasionally I may go back and change one of my own comments if I feel that I have misspoken in some way. Ken, I know you disagree with that, which is fine, but that is how I run the blog here. @Xin, I agree. For many articles there is much more detailed and insightful information in the comments than in the blog post itself. I have always appreciated that about the readers here – we have some of the most knowledgeable p2p investors. Many know far more than I do. I’m having trouble trying to figure out what you guys are even arguing about. But that’s ok.
Lendstats………….Off topic I suspect but I have to ask. Do you know why there are a few Prosper loans from 2009 & 2010 that are still listed as “issued”? That seems impossible to me. I think we are all in agreement that any formula is going to have far less accuracy in predicting returns for young loans than for old loans. Peter, your timing is uncanny. Just last week I thought about posting a discussion on your forum regarding the pros/cons of the various return calculation types – thank you for beating me to punch and raising the issue here. I think the bulk of the comments following this article underscore the complexity and subjectivity of trying to find a “true” return in an industry that is being formed right before our very eyes. Thank you for offering the information to the public; I hope it communicates (above anything) that new investors need to understand there is more to comprehending what their actual returns are (or could become) when/if they decide to participate in Peer2Peer lending. On a personal note, I lean towards Microsoft Excel (XIRR/IRR/PV/FV and various other functions) when doing my homework and projections. However, I think Lendstats and NSR are helping to inform the P2P investment community by balancing what the platforms say against their own calculations as I would agree the platform data can be “misinformed” at face value – especially when one takes the secondary market trades into consideration. As Lou appropriately mentioned above, “Two percent is a big difference.” I hope both NSR and Lendstats continue to push the math as far as the various platforms will allow (through Prosper/LC publishing of their respective platform datasets). Lastly, I am going to make an assumption (as dangerous as that it is). It seems to me your target (or at least primary) audience for SocialLending.net is the new/novice investor that likely does not have a finance background. If that assumption is correct, I think it would be fun for you to offer a novice level article on the difference of XIRR and IRR or perhaps an article that provides a critical look at XIRR individually/further so that some folks will can learn the limitations or misunderstandings that can be encountered should they decide to make that their preferred/primary determinate of what their real returns are. As the comments above have keenly observed, no approach is perfect. However the more the community knows about the pros/cons of each, the better off we all are. Some editing is OK, but I urge you to use your best fair judgement. I think those are listings that never became loans, and it’s just a glitch that’s kept them as issued. I’ve noticed them before but it has been a long time since I’ve been that deep into the archives. So now my memory is failing me and I really can’t say for sure what their current status is without digging into it again. The biggest difference between lendstats/NSR return calcs and XIRR is that LS/NSR do not and can not take into account the effect of idle cash earning 0%, the effect of bonuses or the effect of trades. Because of this, XIRR should usually give a lower estimate as Lou points out with his portfolio (unless you’ve received a lot of bonuses then it could be higher, and of course trading can make it go higher or lower). Even though I agree that XIRR is the most accurate for calculating an individual’s return, I am mostly interested in how my loans on the platform are performing and also I’m interested in how I can improve that performance by reducing future defaults. For those reasons, I prefer to look at the LendStats’ numbers. In the spirit of technical loan performance (and some of the comments you have mentioned above), do either of your websites delve into regression analysis? I have thought about trying to build a model for loan default correlation/prediction. Have either of you ventured into this area on your respective websites? Lendstats……….Thanks. Actually all I did was click the 2009 & 2010 on the front page & then scroll down to the loan status numbers. That was the extent of my investigation. I understand your explanation but if that were the case wouldn’t something like that be a fairly easy & obvious fix considering that you get updates from Prosper every day? I realize that none of this is of your doing & that you work with the numbers supplied to you. I also realize that we’re not talking about large numbers here. However, I think that it is disconcerting that these small obvious errors can remain for all this time & it does tend to make someone wonder if any other not so obvious errors might exist as well. Sorry, I misunderstood, I thought you were talking about the data within the Prosper export files themselves. I see the problem now and I’ll have to look into it. Thanks for pointing it out. Yes, sometimes problems happen when your dealing with a 6 gigabyte data set. There are no easy fixes with files this size. I’ll try to find the source of the problem right away. It could take me hours or it could take me days. It could be a problem with LendStats or it could be a problem with the data from Prosper and I may have to design a work around for it. I can hope there is an easy fix but I fear there is none. The LendingClub data files are a little easier to manage @ 24MB. I assure you that no problems exist with that data at all. I do intend to do linear regression analysis one of these days, and I plan to use artificial inteligence, but when I do that, it will remain a private application. 6,000 MB vs 24MB. That’s a rather large data export difference! @Dan, thanks again for bringing this to my attention. I have located the primary source of the problem. It was a uppercase/lowercase typo, my fault. Now no issued loans pop up for 2009 and 2010, however, there is one that pops up on 6/10/11 and I have yet to locate the reason for that error. Again that could be a Prosper problem or a LendStats problem. It looks like I’ll have to reload the entire private database to figure that one out. Lendstats………..Thank you for tracking that down so quickly. @Dan, Thanks for following up with Ken on the old issued loans. @Chris, Often these comment threads move in unexpected directions – I never mind as long as the discussion is informative. One day, I will do a step-by-step comparison of XIRR(), IRR() and other Excel functions. There are many investors who have only a rudimentary understanding of these things. I do not know how to do regression analysis so I will leave it up to others to perform these tasks. @Lendstats, Thanks for looking into those issues with old issued notes. @Charlie, From what I gather the Prosper dataset is a lot richer, but Ken would be able to tell you exactly what the differences are. Still, it seems strange that there is 250 times more data from Prosper. I realize your eagerness to point out any flaws at lendstats but I implore you and anyone else to let me know about any issues with lendstats right away. I am human and I am capable of making an error. Dan’s comment was the first that I heard of this issue, which was caused by a work around I recently did to fix an inconsistency in the Prosper data set. Yes the Prosper data set is huge. Don’t forget that Prosper dataset is in xml format (which takes a lot more space than regular spreadsheets), it includes all ~9 million bids, and it includes all >1 million members and it includes the information for each loan every month that each loan is active which is now a table with well over 1 million lines. So assembling all this data is no small task, this in fact is a monstrous undertaking, which I rarely seem to get much credit for. The lending club data set on the other hand is one spreadsheet with 40,000+ lines. @Lendstats, That is simply not the case that I am eager to point out any flaws with Lendstats. Nothing could be further from the truth. I have been, and will continue to be, a big supporter of Lendstats. I am sorry if I have created a different impression. I have downloaded the Prosper XML files but didn’t even know where to begin analyzing the data. I realize it is a major task to keep track of it all and I am grateful you have spent the time and effort doing that. Sorry, I may have been reading a little too much into what I thought you were trying to subtly imply. My mistake. Lendstats……….How would someone contact you directly through your website? I haven’t been able to locate the “contact me” buttons. I’ve got my email address on the homepage, it’s kenl@lendstats.com. You can also ask questions in the forum. @Lendstats, No problem Ken. I can see how you would have misinterpreted some of my statements. I’ve been lurking for a few weeks reading up on historical posts as I have recently involved myself in P2P lending. After reviewing the several different methods of calculating true ROI and spending a long time with recording every possible bit of data (that quickly became impossible now that I’ve reached over 50 notes) I have settled on the idea that XIRR() is going to be the most logical approach to understanding the historical return of my own portfolio over time. I just had a quick question as to how you are handling defaults, is it simply ignored because eventually it’s payments (or lack there of) will bring down the ROI figure and then lending club discounts them off account value for you? Have you thought of using status IF statements off imports to discount them in ratio to the platforms recovery rates listed on the site for each of the different latency categories? @K, There are third party tools available for what you are discussing. On Lendstats.com you can enter your Prosper screen name and see your estimated ROI with different loss factors in place for the lare loans in your portfolio. For Lending Club you can go to NickelSteamroller.com and upload a CSV of your portfolio to get the same thing. I still like XIRR() because it tells me exactly what has happened in the past, not what it thinks is about to happen. This way, I can know with very close accuracy, what my real return has been. I use a discounted cash flow method in a spreadsheet like the XIRR one described. It takes into account all funds, invested or cash, additions and timing of them and any withdrawals and timing of them so is very accurate. My actual ROI is significant less than the estimate provided by Lending club. I think their estimates are misleadingly high, am sure it’s on purpose, and one of the things that leaves me with some mistrust of them. Still, my actual return is MUCH better than what I would get from any bank, bond or CD so I’m happy as long as these groups don’t turn out to be Ponzi or similar schemes. @Bill, I have had many conversations with Lending Club and Prosper about their published ROI. My experience has been that Lending Club overstates real ROI by 1%-1.5%. Prosper has a “seasoned returns” number that provides a more accurate ROI but even that doesn’t take into account idle cash. And neither company has a published number that takes into account activity on the trading platform, which is why it is always better to work out your real return for yourself.